Glance through the Christmas stories in the New Testament and you will notice if you’re a careful reader, that there are secrets buried in the various texts. This three-part series reveals these secrets. The first secret slips into the Christmas story from the lips of Gabriel, the angel of God. He shocks the old priest Zacharias who is in the midst of a once in a lifetime chance to officiate in the Holiest of Holies during the morning worship hour in the temple. “Your wife will have a son…,” whispers Gabriel through the incense rising off the altar. But Zacharias mocked the angel and was struck dumb. Zacharias was forced to carry to stifle the secrets for months. *See Willa Cather’s marvelous story, “The Enchanted Bluff” to encounter a delicious secret from a kid’s perspective in Sandtown, Nebraska on the summer river). 2. Our second secret comes via Mathew’s tale in Matthew 1:19. Here we discover a few fascinating “Secrets in a Small Town.“ Once again Gabriel makes a spectacular entrance into the Christmas story with a midnight visit to Mary in the small, quaint town of Nazareth. “You to o will have a child” he whispers to the young woman in the still of the night. She keeps the secret well with quiet rejoicings. But Joseph takes it hard sensing a sudden, inexplicable betrayal on the part of his betrothed. *See some small-town secrets in the classic tale “To Kill a Mockingbird” by Harper Lee who tells of the haunted house and Boo Radley). 3. Our third and final secret, “The Secret Summons,” sparkles in a starry sky in Jerusalem. Herod, the aged and diseased king stares restlessly at a star twinkling above his exquisite palace in the northwest corner of the ancient city of Jerusalem. He fears the implications of the star and sends the Magi off secretly to find the child. Herod’s body is riddled with pain and disease as Josephus tells us in his work The Wars of the Jews (Book 1, chapter 33). Though Herod means to destroy the Child, God has other plans. I paused on my morning walk recently as the sun stretched regally over the Cedar Island marsh that rolls out like a velvet carpet to the shore. The horizon seemed almost to be on fire as I stood and stared in wonderment at the painting before me. And then this deer quietly slipped out of the dark forest brush on full alert fully aware of my intrusion into his morning ritual. It was one of those mystical moments that I knew would vanish within minutes. I wanted so badly to freeze it, to command it to linger longer, but, alas within a few dolorous winks of a faint morning breeze, it was but a delicious memory. In some ways, this sunrise fantasy reminds me of the year just past. It rose with promise balancing on the precipice of time and then quickly vanished into December’s mist. Gone. Within a blink or two twelve months slipped into the sea and left me realizing how fragile time really is, how fleeting the gift of life can be. I stood a few minutes longer beneath the golden haze lost in lazy thoughts wondering what the deer was thinking and if he sensed the divine like I did. I wanted to ask him, but before I could the sun bade farewell, the day began, and he was gone. We had another successful shoe box campaign this year. Everyone gathered on a Wednesday night, including the girl scouts who helped this time. 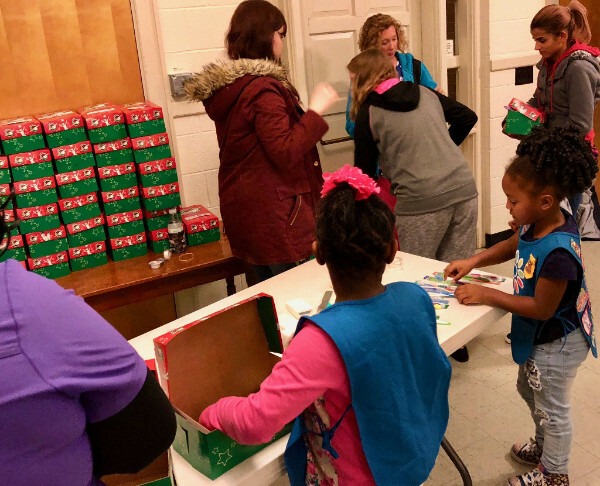 Shirley Deeds spearheaded the event and close to 80 packed boxes were stacked in the sanctuary ready for delivery to the needy around the world. The kids are practicing for the Hanging of the Greens service in December. 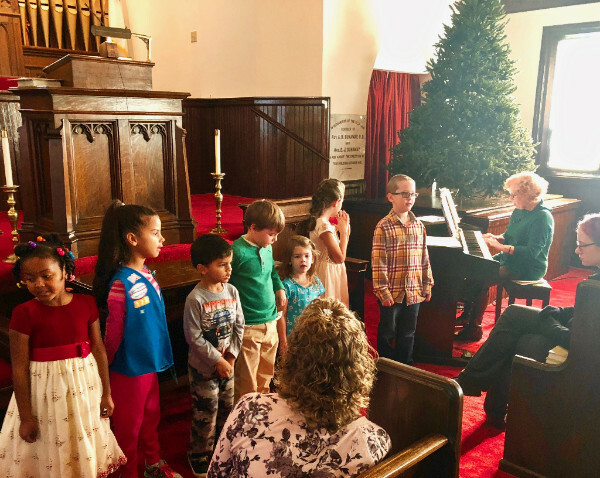 Jo Coniglio, the church organist, teaches them the songs for the service. Megan Campbell watches from the front seat. During the service on Sunday morning, these kids were such a delight to all the congregation. They sang several songs and then bustled off stage to gather in ornaments which they paraded down the center aisle of the church in an endless stream dropping off their ornaments and looping into the back to gather more. Thanks, kids, for your participation. 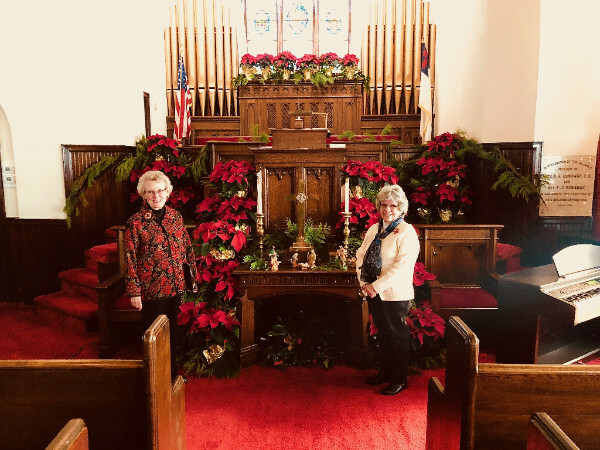 Dale Parks and Linda Young pose beneath the pulpit in front of the poinsettias. 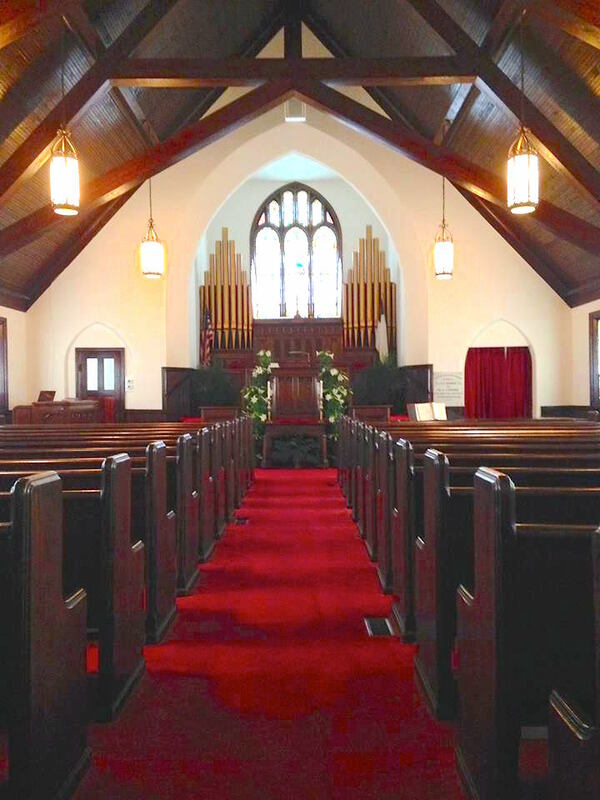 All the members of the Flower Committee (Alice Rew, Ted Lewis, Amy Kay Hines, and Shelly Mize) did an exceptional job of decorating the church. This is one of the most beautiful sanctuaries on the Shore. Be sure to stop and enjoy it before the holidays slip away. 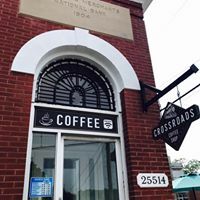 The Dream Team will have its first meeting on January 20th at 10:30 at the Crossroads Coffee House in Onley. Anyone is welcome to participate. Currently there are eleven volunteers. Our mission is a simple but complex one: DREAM! What can we do to make our church better, more effective, more interesting to absentee members and outsiders. Our goal will be to dream of ways to spur growth and inspire many in the surrounding area to become a part of our church family. 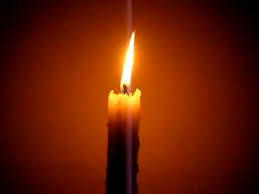 The Drummondtown Baptist Church Candlelight Service will be held December 23 at 7:30 pm. Everyone is welcome. Let’s not forget the miraculous offering on Harvest Home Day, November 19, 2017. On this hallowed day, the church gave from free and thankful hearts over $21,000.00! The pastor will be out of the pulpit for two weeks– December 31, 2017 and January 7, 2018.